Which Protein Powder to Choose? Protein in milk is 80% casein and 20% whey. Whey is a complete protein meaning that it contains all 9 essential amino acids and digested faster than whey. It is the gold standard of protein supplements. Whey protein comes in several forms. Concentrates, Isolates and Hydrolosates. Whey concentrates: water is removed. It contains lactose, fat and cholesterol. Whey isolates: a little more protein than concentrates but less lactose, fat and cholesterol than whey powder. Whey hydrolosates: the protein is predigested, they assimilate into the body faster than isolates and hydrolosates and are more costly. Hydrolosates can have a bitter taste. Concentrates and isolates are already fast-digesting, so a hydrolysate, which digests minimally faster, may not be worth the taste tradeoff and extra cost for the small benefit. Casein is also a complete protein and has a lower biological value than whey. (BV is a measure of the percentage of protein absorbed and used from the total protein consumed). Since casein is absorbed more slowly than whey and the amino acids released over time, casein at bedtime is beneficial as it supplies protein throughout the nights as the body goes through a catabolic state and uses protein tissue for energy. A combo of casein and whey works well. Rice Protein powder: is hypoallergenic and well absorbed plant protein although not complete protein. So this needs to be combined with other plant protein sources. Mix other protein sources for a better amino acid profile such as nuts or rice. Pea Protein Powder: easily digested and not commonly allergenic. It is not a complete protein. So this needs to be combined with other plant protein sources. Mix other protein sources for a better amino acid profile such as nuts or rice. Make sure that the protein item is listed first in the ingredient list. Typically the fewer ingredients the better; avoid powders with sugars, sweeteners, vitamins, minerals, herbs or guarana. Adults in the U.S. are encouraged to get about 46 to 55 grams of protein for women, and 56 to 66 grams of protein for men per day. Those who are strength training need to calculate their protein needs according to this: 1.2 g/kg body weight per day for advanced and 1.5–1.7 g/kg body weight per day for novice. So for a 130 pound person who does advanced strength training, they need 59 grams of protein. Keep in mind that plant sources of protein are incomplete (they do not have all the essential amino acids), with the exception of soybeans and quinoa. If a vegetarian has a limited diet, they can potentially not be getting their daily protein needs met. They must be careful to eat a wide a variety of protein rich plant foods. See here for more information on getting adequate protein. For those eating meat, 1 ounce of protein provides about 7 grams of protein. But for the vegetarian, these options offer a meatless alternative for 1 ounce of protein or 7 grams of protein. Cut lemon into slices. Set aside. Season salmon with salt and pepper. 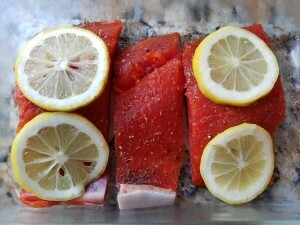 Place salmon, skin side down, on a non-stick baking sheet or in a pyrex glass baking dish. Bake until salmon is cooked through to 125 degrees about 12 to 15 minutes.